We will have a trade stand in the Palace Suite (P32) next to Leisure Games selling a wide range of new and second-hand products for Traveller and many other systems. As with previous years, we will be running a series of RPG tables using the Mongoose Traveller ruleset. Our RPG adventures will be a varied adventure set written by our ever aging stable of crack (ed) GM's. As always find us at http://www.bitsuk.net and http://www.powerprojection.net for more info on BITS and Power Projection. 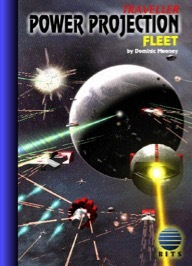 BITS are very pleased to announce that the Power Projection: Fleet has been released as a PDF, making our fusion of Traveller and Full Thrust starship combat available once more. It appears we have suffered a misjump, but we’re back and as soon as the navigation data is resolved then things should be hunky-dory. Well, mostly. We have lost some files and pictures, but I will recover them from archive over the next week or so. http://www.powerprojection.net will be down for will be back in the next two weeks, as it was on the same server. Apologies that it has taken so long to resolve.